Who’s ready for the ultimate fishing adventure? We have teamed up with our friends at Tofino 1st Class Fishing to offer a culinary experience like no other. At Wolf in the Fog, we honour Tofino’s culinary bounty every single day and sourcing those oh-so-delicious ingredients is all part of the adventure. We are thrilled to invite our guests be part of this experience with our Catch & Cook package. Explore Tofino’s coastal waters with the pros at Tofino 1st Class Fishing and return with a bounty of delicious seafood, which Chef Nick Nutting will turn into an incredible feast, the following evening. The ultimate boat-to-table adventure begins with Joel Nikiforuk, co-founder of Tofino 1st Class Fishing and Wolf Pack alumni. 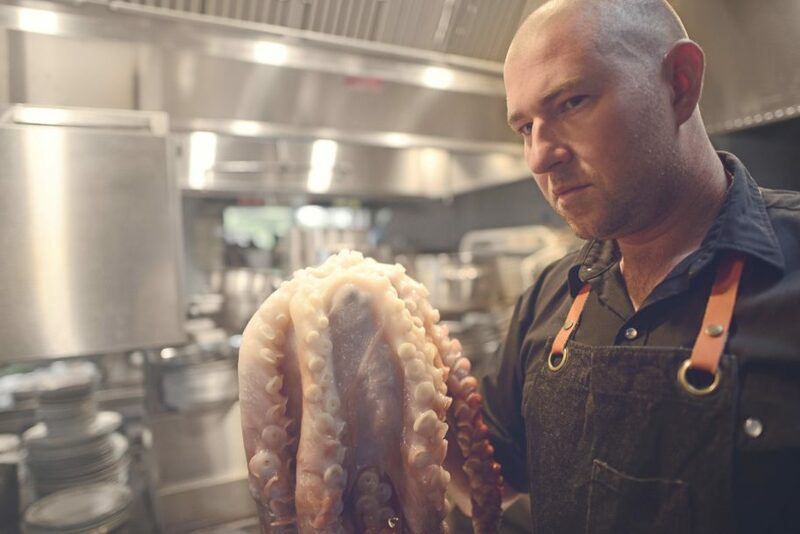 Born and raised in Tofino, Joel knows the waters of Tofino like the back of his hand, making him and his team the perfect guides for this culinary quest. Whether you’re a relaxed fishing enthusiast who enjoys soaking up the sun and sipping on a cold beverage, or like to see yourself as a captain of the sea, guests can enjoy a variety of half-day, one-day, two-day or three-day fishing excursions around Tofino’s abundant shoreline. The following evening, Wolf in the Fog’s Chef Nick Nutting will cook an exclusive multi-course dinner (4 course $80, 5 course for $100, 6 course for $120) using your very own catch of the day! As one of the top chefs on the West Coast, Nick will plate multiple appetizers, a magnificent main course and a tasty dessert selected from the evening’s pastry specials. For those looking to complete the feast, wine and cocktail pairings are available (from $70/pp). So, are you ready to book the ultimate boat-to-table Tofino adventure? With limited spots available, it’s time to throw on your fishing gear and pack your stretchy pants for a truly unparalleled experience! ©2019 - Wolf In The Fog. All Rights Reserved.